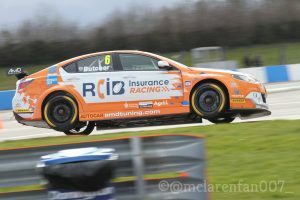 The AmD with AutoAid/RCIB Insurance Racing team enjoyed a fine start to the new Dunlop MSA British Touring Car Championship season with four points scoring finishes leaving the team well placed in the early standings. 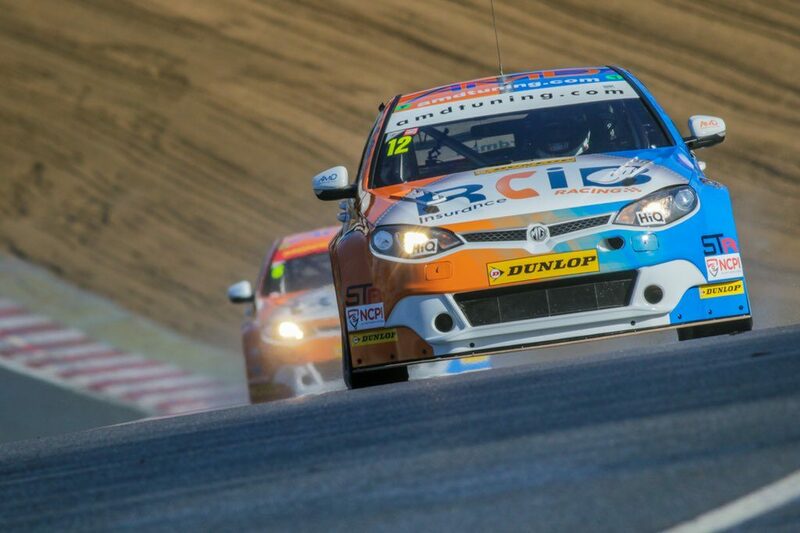 The West Thurrock-based team was running its new MG6 GTs for the first time in competition having acquired the ex-works car during the winter, with drivers Rory Butcher and Tom Boardman hoping to impress on their debuts. Fife racer Rory was the better placed of the two after a highly competitive qualifying session on Saturday afternoon, putting his car 24th on the grid despite his best time being just six-tenths of a second away from pole position. A solid opening lap in a wet first race saw him immediately jump up into the top 20 and the Scottish racer would gradually work his way forwards through the midfield to secure a points finish in 13th spot. Ahead of the second race, the team faced a decision over which way to go with tyres on a drying circuit, with the MG taking to the grid on slick rubber. Although that saw Rory drop places in the early stages when the circuit was still damp, he started to make forward progress once again as conditions improved and crossed the line in ninth for a second points scoring finish of the weekend. Race three would be the only race to run solely in the dry, and Rory once again showed the potential of the MG with his strongest drive of the weekend – running inside the top eight throughout and picking up a sixth place finish that leaves him in a solid ninth place in the early championship standings. Team-mate Tom started the opening race from 28th on the grid and like Rory, would work his way forwards through the field in the opening race to finish just outside the points in 18th place. Also electing to run with the slick tyre in race two, the Forton-based driver would be one of the stars of a dramatic second race as he stormed through the field having dropped as low as 25th early on. As conditions improved, the former race winner was consistently amongst the fastest drivers on track as he rocketed up to fourth place – taking the flag little more than two seconds away from the race winner. From the second row of the grid for race three, Tom was in the ideal position to try and at least match his result in the final encounter of the weekend but contact at Paddock Hill Bend on the second lap saw him slip down to eleventh with further jostling in the pack later on seeing him demoted to 18th by the finish. Tom ends the weekend 15th in the standings, with AmD with AutoAid/RCIB Insurance an impressive fourth in the teams’ championship. “I’m delighted for the whole team with the way the weekend has gone. Considering the amount of pre-season running we have had and the fact that my deal came together quite late, it’s brilliant to come away from the weekend with three points scoring finishes and P6 in race three was a great way to end it. “We are still learning with the car every time we go out on track and sometimes we don’t always get it right, as was the case in qualifying. But come race day we really had the MG working well and I think we showed we have a good package in both the wet and the dry. “This was always going to be a learning weekend for us and I think we have learned a massive amount and also picked up some great results to go with it. It was my first weekend in an NGTC car so I didn’t really know what to expect and the first race was all about trying to make up places and stay out of trouble. “There has been so much effort that has gone into making this programme possible and to come away from the opening round with both drivers having picked up such strong results is fantastic. “We obviously knew that the MG is a good car but we haven’t had much time to work with it on track during the winter and this weekend was all about learning as much as we could and trying to pick up some points. “Both Rory and Tom have driven brilliantly in the conditions and to end the weekend six points off the lead in the team’s championship is way beyond anything we could have expected.